In January I will be taking an enameling class from Margaret Langdell at the Brookline Arts Center. I have never worked in enamels before so I am very much looking forward to it. I have some ideas for enameling my anticlasts as well so stay tuned to see what I learn. I am finally beginning to create pieces that are satisfying to me using the new skills I acquired in the Micheal Good class I took a few months ago. 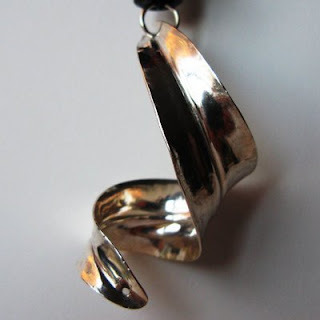 Here is a sample pendant I created using anticlastic raising as well as fold forming. I really like fold forming. I can see myself pursuing that direction more as the metal can be be formed very quickly and in an interesting manner. For more on fold forming check out Charles Lewton Brain.